Heat oven to 350°F. Spray bottom and sides of 13x9-inch pan with cooking spray. In large bowl, stir cookie base ingredients until soft dough forms. Press evenly in bottom of pan. Bake 15 to 18 minutes or until golden brown. Cool 15 minutes. Meanwhile, in large bowl, beat cream cheese with electric mixer on medium speed until light and fluffy. Beat in cream of coconut until well blended. Beat in lime juice, vanilla and 2 eggs until smooth. Spread over cookie base. Bake 40 to 45 minutes or until set and light golden brown on edges. Cool 30 minutes at room temperature. Refrigerate 1 hour to cool completely. Carefully spread frosting over filling. 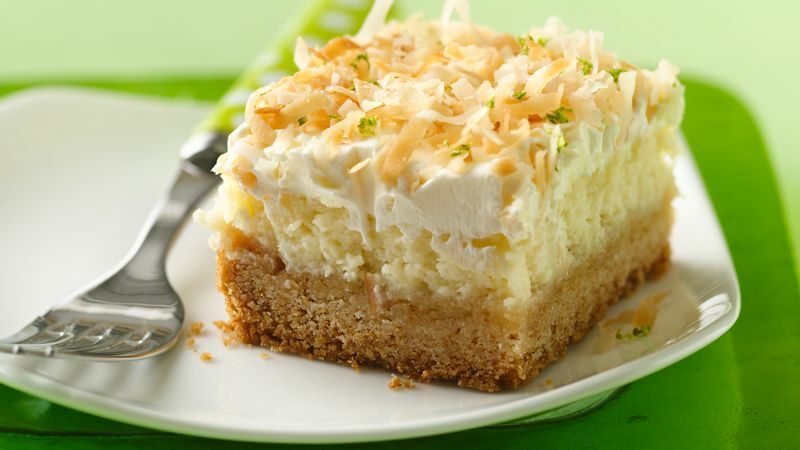 Sprinkle with coconut and lime peel. Cover; refrigerate 30 minutes. For bars, cut into 6 rows by 4 rows. Store covered in refrigerator. How-To To toast coconut, spread on ungreased baking sheet and bake at 350°F for 10 to 15 minutes, stirring occasionally, until coconut is light golden brown.